Our Deluxe Scrambling Pack contains all the hardware you need to start scrambling. Combined with good hill skills, a harness and a helmet, it allows you to tackle steeper mountain terrain. Ideal for hill walkers looking for the next challenge, and indoor climbers taking their first steps outdoors. 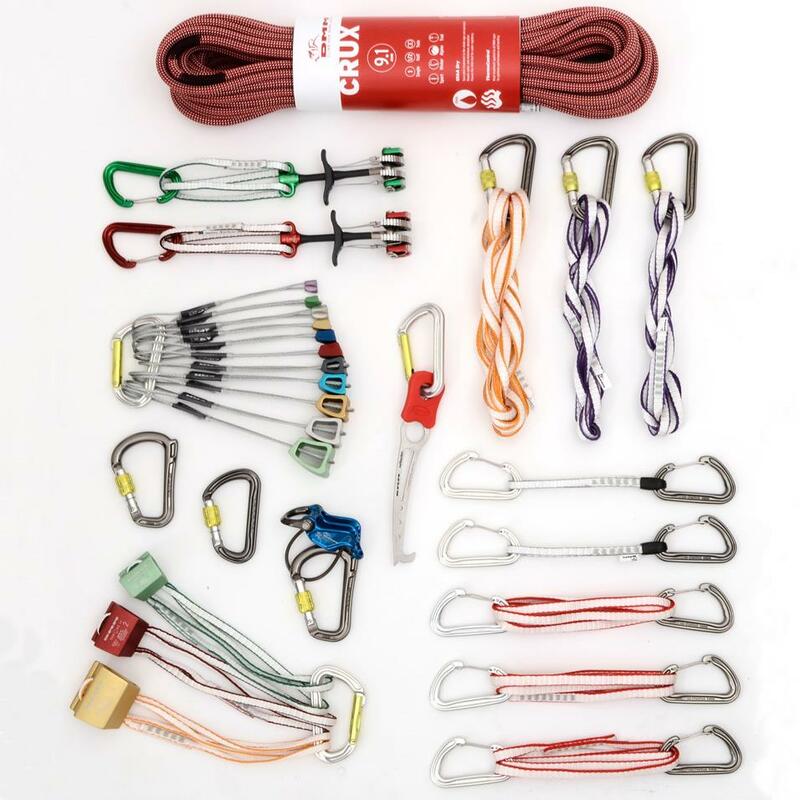 The Deluxe Scrambling Pack also makes an ideal base for building your first trad rack. 30 meters of our triple rated, dry treated Crux gives you a versatile tool for moving together, protecting tricky pitches, and making abseil descents. Our UIAA Dry treatment keeps the Crux light and supple in wet or cold weather, making it an ideal scrambling rope. A set of Wallnuts provides lightweight and versatile protection for when you need to rope up, build a belay, or climb a pitch. Racked on our Shadow straight gate biner. The Pivot is an ideal companion for belaying and abseiling. It features an innovative guide mode feature that gives you better control when lowering a second in guide mode. The Rhino is a strong belay carabiner that gives smooth rope control when used with a Pivot in guide mode. An 18cm quickdraw is a good option for parts of the route that follow a straighter line. The Phantom is the lightest carabiner in our range, ideally suited to big mountain days. A highly versatile quickdraw. The extendable 60cm sling lets you extend placements to reduce rope drag on wandering lines and changes of direction. The sling also lets you use naturally occurring anchors as protection. Lightweight Dynatec slings that can be draped over or wrapped around naturally occurring features like rock spikes and threads for protection. The 240cm sling lets you use bigger natural features as protection, and can be used to create a single central connection point in a multi-anchor belay. The Nutbuster is an invaluable tool for retrieving stubborn placements made by the leader, or for deconstructing belays when following them up a pitch. Racked on a Shadow Straight Gate for lightweight, easy racking. An extra Rhino carabiner, useful for Italian hitch, and a spare Shadow that can be used as a secure connection point in belays or on runners. For placements where Wallnuts and Torque Nuts won’t sit, Dragon cams are the tools of choice. Our premium cams excel in protecting pockets and parallel sided cracks, and feature an extendable sling that reduces rope drag if your route wanders. They come racked on colour coded Phantom biners for easy identification. Torque nuts are a modern version of the classic hex. Incredibly versatile, they can be used to protect a wide variety of crack types including cracks that are almost parallel.